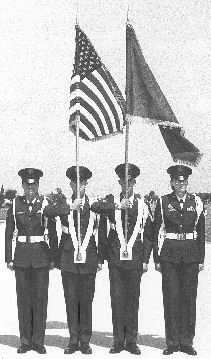 Positions of the Flag at the Carry. At the carry, the ferrule of the staff rests in the socket of the sling. The flagbearer grasps the staff with the right hand at the height of the shoulder, only using the left hand to steady the staff in a strong wind. The staff is inclined slightly to the front. The flagbearer comes to the carry when the adjutant directs GIVE YOUR GROUPS PRESENT ARMS.